Precession of The Albums is a £5 retrospective yielding you 12 songs hand-picked from the live favourites so often requested at gigs. 'Precession' refers to the slow reverse rotation of the earth's axis. Often the word is used in the context of 'Precession of the Equinoxes' where the point of the sunrise at the equinoxes shifts through each of the 12 signs of the Zodiac over a 25,920 year cycle. It seems that humans have known about this for thousands of years. 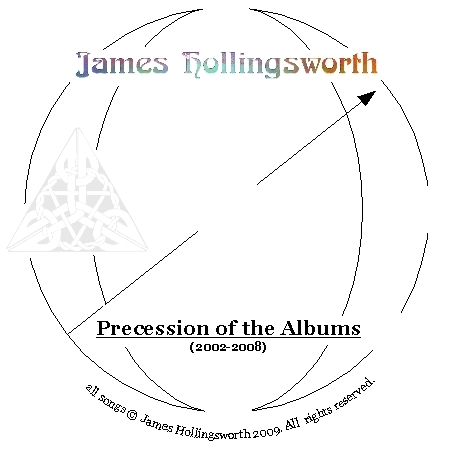 Also, there's a pun hiding in the title - following the so-called Credit Crunch James wanted a lower price cd, since the recession had resulted in a drop in his £10 value cd sales. Get the album direct from James at a gig, or press the Buy Now button above to order via Paypal. Buy now direct from James using secure online billing with Paypal for £5.50 including postage. The album is available for mp3 download from Soundclick for the promotional price of just $3. © 2009 James Hollingsworth. All rights reserved.